Another week, another chance to experiment with interesting ingredients. You all know me by now…I just can’t help myself. Lurking around in my freezer were some chunks of oxtail that I had purchased from my trusty friends at Grasspunk, out of a curiosity and a hankering to tinker with new stuff but with no end plan in mind. I started by reading about oxtail on the internet and found a multitude of recipes for oxtail stew or soup. 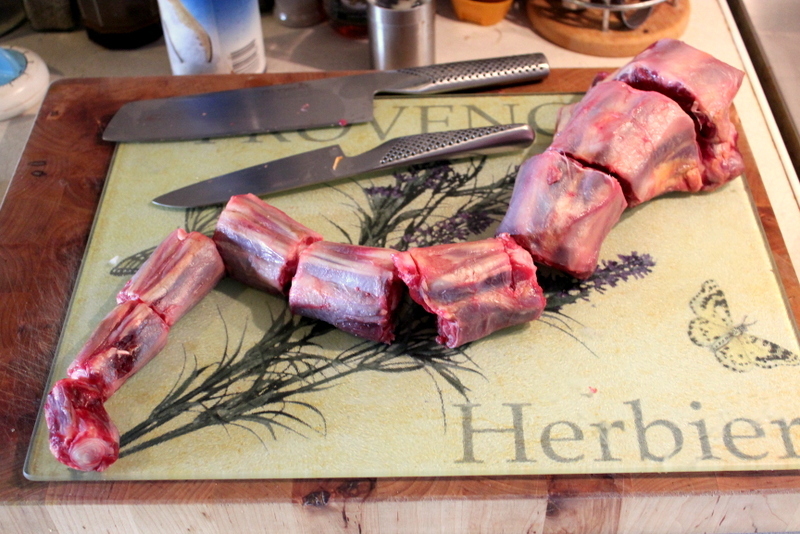 Naturally the bony morsels require long slow cooking to make them tender and release their inner magnificence. Honestly, an oxtail ain’t much to look at raw! The fact that you cook the chunks with the big bone running right through the middle means that all the marrow is released making the sauce exceptionally tasty and slightly gelatinous. The meat itself is very beefy and has a similar texture to beef cheeks…quite unique and wonderful. So, my basic plan was to braise the hell out of the oxtail, long and slow with lots of lovely red wine and other delicious additions. Then the meat would fall off the bones and I could combine it with the thick, viscous sauce and some Girolles mushrooms to form a deluxe cottage pie. Sounds simple right? Hmmm, well the reality was rather more convoluted. I guess the truth about these cheaper cuts is that they are awkward to cook with. You have to work a lot harder to unleash their true potential. Taking advice from other recipes, I thought the oxtail would take about 3 hours to braise, but in fact, it took more like 4 1/2 and actually could have cooked for even longer if it was not already past my bedtime! Grass fed beef does take longer to cook, but I still think if I had let it braise for 6 or 7 hours, it would only have been better for it. But, after throwing the shreds of meat back into the sauce and letting it bubble away and reduce, it all started to come together. Using sautéed cabbage as the bottom layer for my pie helped to contain any rogue juices and the final tower of meatiness was a fantastic triumph. And it was seriously good. I mean really really good. The rich sauce coated the tender beefy chunks, joined by those intense Girolles and topped with soft mashed potato, it tasted luxurious and opulent. It also looked pretty magnificent if I say so myself. Honestly, who knew that something so unappetising and awkward could transform into something so sumptuous and impressive. It was worth every single hour of toil! Heat your oven to 160 Fan/180 C. In an oven proof casserole pot, heat the duck fat. 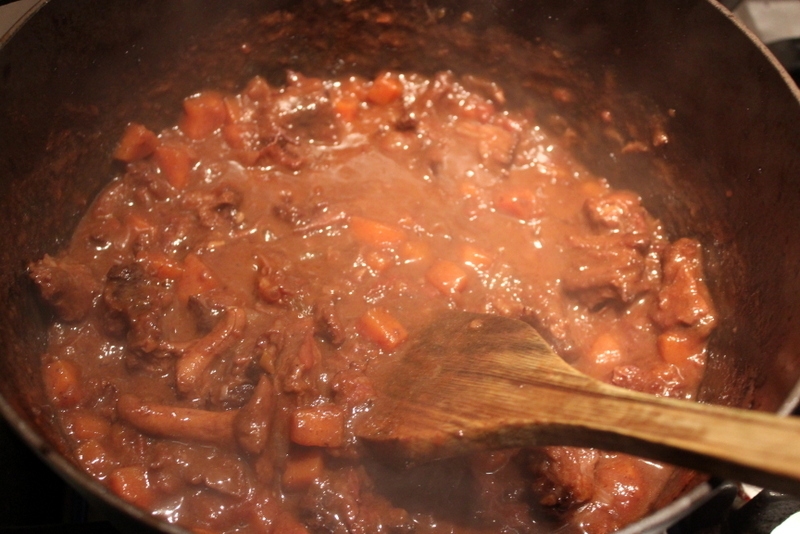 Dust your oxtail in the seasoned flour and then brown all the chunks for around 10 minutes until well coloured. 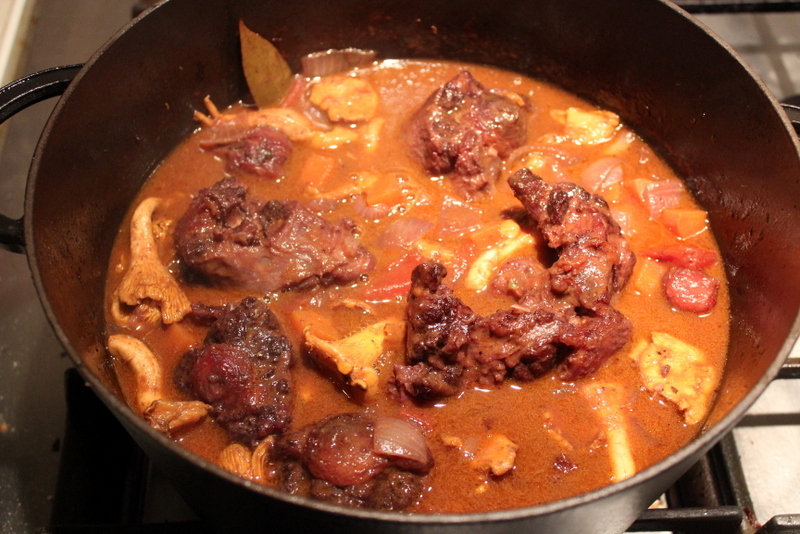 Remove the oxtail from the pan and throw in your onion, carrots and tomatoes. Let these cook for a few minutes to soften. Stir in the tomato puree, garlic, paprika and anchovies. Cook for 2 minutes more. Add the port and the bay leaf and bubble for 3-4 minutes. 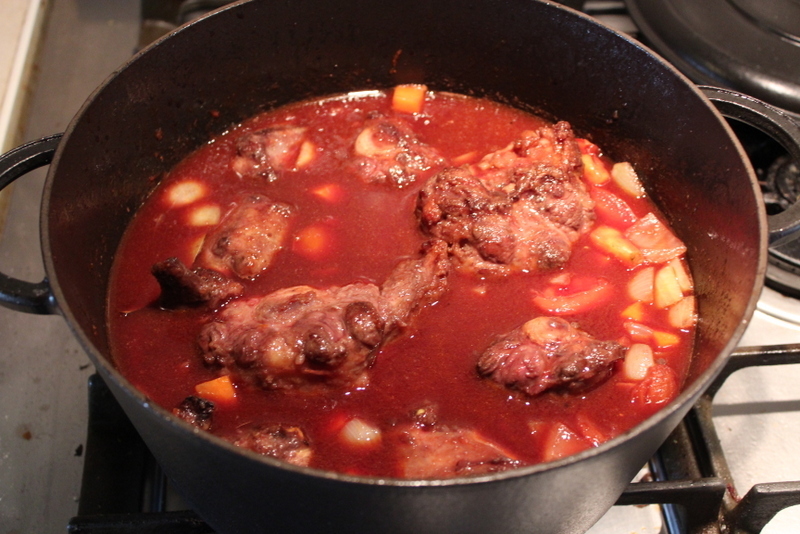 Then return the oxtail to the pan and pour over enough red wine to almost completely cover. Bring to a slow boil, pop the lid on and put it all in the oven for 3 hours. After cooking for 3 hours, check the liquid levels and add some water if it is looking too dry too quickly. You can also throw in your Girolles which can take long slow cooking with out loosing their body. Return to the oven for another 1 1/2 hours minimum. Go longer if you have the time. Remove the oxtail from the pan. 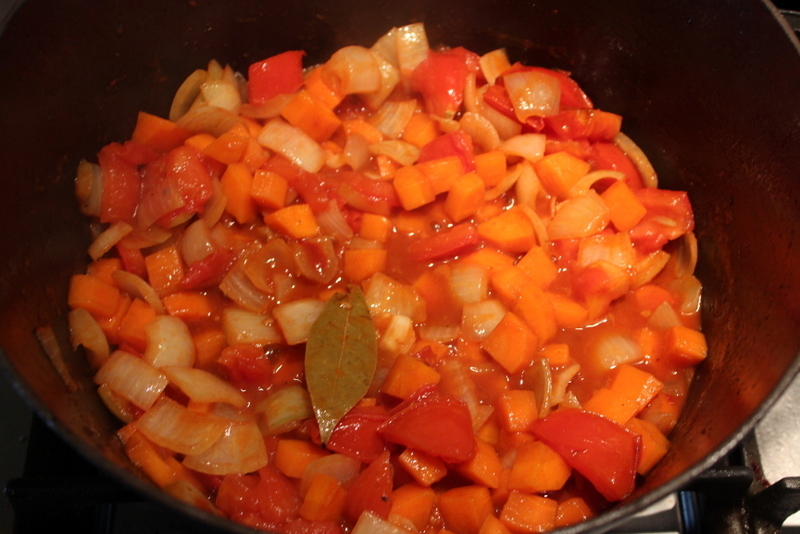 Put the remaining sauce and vegetables on the heat to begin to reduce. 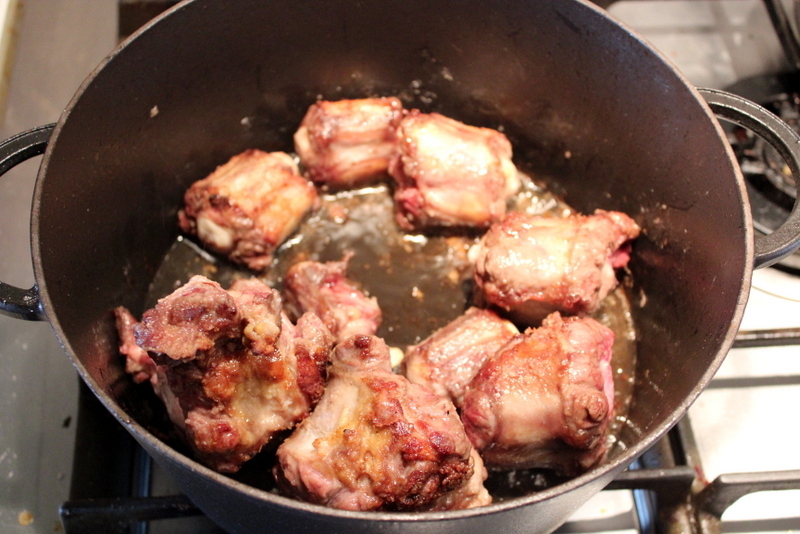 Then carefully remove as much meat as you can from the oxtail. Return the meat to the pan and let it all bubble and reduce for 10-15 minutes until it’s quite thick and coats the meat well. Meanwhile, sauté your cabbage in butter and olive oil with plenty of seasoning, for 5 minutes until cooked through. Also make your mashed potato. Assemble your dish. 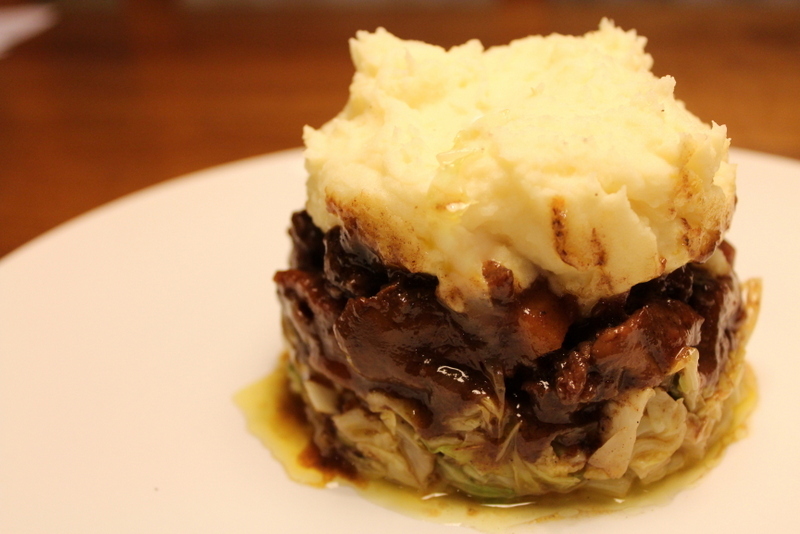 I used a metal ring with a layer of cabbage first, followed by a good layer of the meat and vegetables and sauce, topped off with the buttery mash. I am entering this recipe into a few blogging challenges. 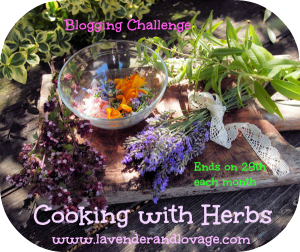 Firstly, my old favourite Cooking With Herbs hosted by Karen from Lavender & Lovage. Secondly, as Oxtail are a cheaper cut and in fact, used to be given away free by butchers, I think it qualifies for Helen and Camilla’s Credit Crunch Munch. 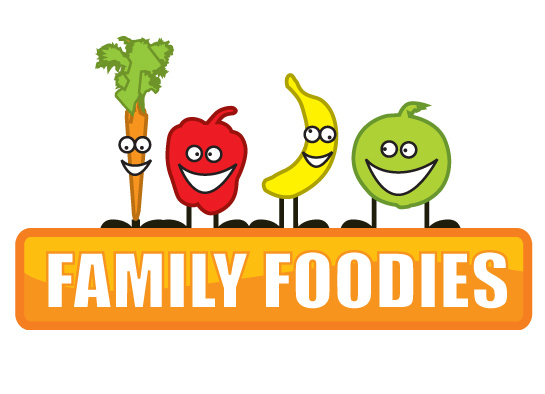 This month it is hosted by Michelle from Utterly Scrummy Food For Families. And also, as this is most definitely a ‘Weekend Slowy’, I think I am able to enter it into the new Family Foodies challenge hosted this month by lovely Louisa from Eat Your Veg and alternately Vanestha from Bangers & Mash. I am glad to be a part of it for the first ever time. 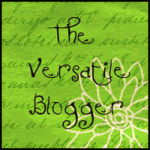 17 Comments on "The Tale of the Elegant Oxtail (Deluxe Cottage Pie)"
Anneli this recipe looks absolutely divine! I love these types of dishes especially during these colder months. Fabulous! A slow cooker is ideal for the long slow cooking an oxtail needs to release its full flavour. It is an ideal dish for the cooler months when robust flavours come into their own. Yes, I did consider using my slow cooker for the oxtail and I think I will next time. But on this occasion, I thought I would do it on the hob for all those with out a slow cooker to test out timings etc. Definitely a powerful dish best suited to cold and cosy times! Oh how lovely. I have had something similar to this in France before and I loved it. The richness os slow cooking and the flavours you get from the bones makes this a labour of love but well worth the effort. You may have started with a humble piece of meat but your cottage pie looks and sounds wonderful. Thanks Karen. So glad you like it. I was amazed how good it looked at the end after starting with such a funny looking ingredient!